Aikatsu Friends! – 023 | Mezashite! I’m conflicted! This episode was great! But… it was done by… by Kyogoku Takahiko! It was his first actually good idol anime script and direction! If only he could stay like this on the light side and never return to the dark one. But, the power of money is too strong. My friends, never be blinded by greed and lust, for they will make you stray from the righteous path of Aikatsu. I’ve been thinking 100% the same thing since I first saw he did the ENTIRE episode. I’m pretty sure he’s just good at anything that’s not Love Live (haven’t seen his involvement in Pretty yet). It could just be me but it seems that we’re seeing more of the girls’ home-lives in Friends than we have previously, which is kind of nice. It’s essentially this season’s replacement for the M4 subplots, and an evolution of what was done in Stars with showing Mahiru’s relationship with her family. I would also count the Akari/Tsubasa stuff from Akari Generation as ‘home life’, but I might be biased because that’s my favourite series. Trivia: Maika’s brother is voiced by Kensho Ono, who voices Harry Potter in the japanese dub, several important characters in sports anime (such as Kuroko), and will feature as Giorno in the upcoming Jojo season. You couldn’t ask for a cooler onii-chan. On the other hand, this episode feels like a closure for Honey Cat. 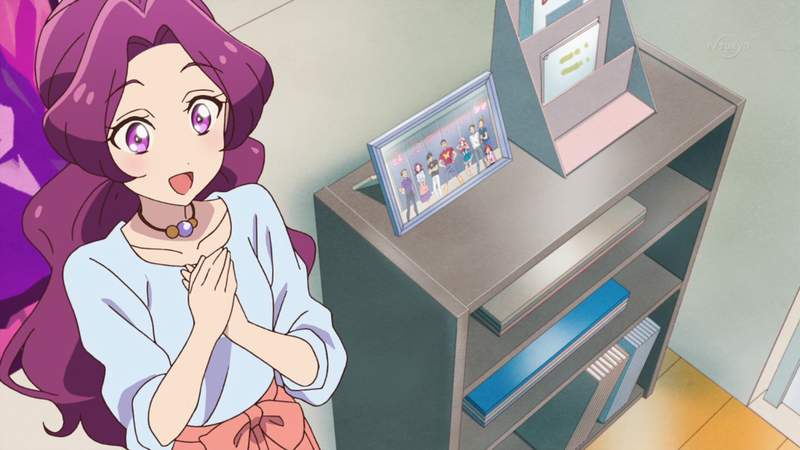 They are out of the overarching competition, Ema has had her epiphany about doing both Aikatsu and lacrosse, and Maika realized her dream. So where do they go from here? I hope they won’t just become side characters in the second season. If you ask me, after the Brilliant Friends Cup that’s soon, they’ll win some other competition called something like Super Duper Friends Cup, which will let them compete in the Diamond Friends Cup. The first season’s not even halfway over. I’ll eat my hat if Friends is over 50 episodes (please actually hold me to this). It’s looking like they’re taking the Precure route of rebooting yearly. I’m not sure I’d have a problem with that to be honest if it maintained the quality that Friends has. I watched the entirety of the original Aikatsu but only the first 60 episodes of Stars (Though that was due to outside circumstances.). If they switch to a yearly schedule while maintaining the quality we have now or even improving on it, I think it’d work. I like this episode a lot! It’s cool seeing family be a bigger element, and I’m also thrilled to see designer approval make a comeback! That’s probably one of the elements I missed the most in this series. I love how in this day of modern technology which enables results of major competitions to be spread around in mere seconds, Maika’s entire family were absolutely ignorant of Honey Cat being kicked out of the running despite (a) said disqualification taking place 4 weeks earlier, (b) the presence of an television and the Internet which would have updated them on the latest happenings and (c) due to not even bothering to go and watch their own daughter’s performance at all. Either they were all on a sabbatical located deep in the mountains without any wifi to hone their boxing skills, or Maika managed to hoodwink them into thinking HC had won-which still doesn’t make sense because, duh, Internet. Hypnosis. The entire family was under Maika’s spell. It only got broken when Maika herself made up her mind to tell them the truth. I knew there would be an easy supernatural explanation. This was by far my favorite episode so far. Absolutely incredible in all aspects: animation, plot, characters, direction. A priceless gem. I’m loving AiFure more and more. I just wish that the authority’s presence would be a bit more present.